The main problem with this article is that the underground submarine base has been visible on Google Earth since at least August 2006, when it was mentioned on Ogle Earth. The article misrepresents what is new information. 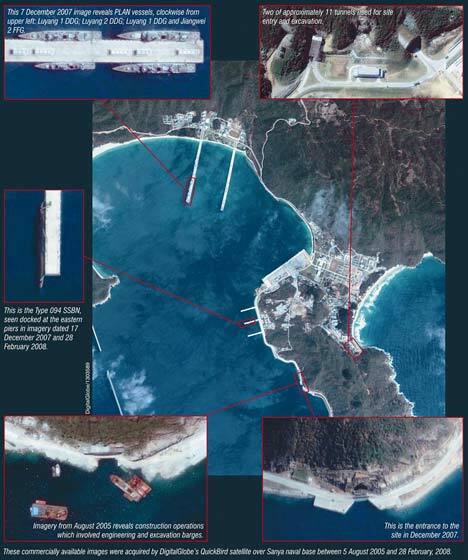 Jane’s Defense Weekly has indeed commissioned a new image of the base from Digital Globe, much like we all could if we have a few thousand USDs to spare, and not surprisingly the imagery shows the submarine base being used by, wait for it, submarines. It’s always good to get access to updated imagery, and JDW’s commissioned imagery is from February 28, 2008, vs Google Earth’s from January 14, 2006. Comparing the two, you can indeed see that land access tunnels that were under construction in 2006 have now been completed. However, when newspapers pretend they are at the forefront of intelligence gathering when in fact they are the laggards, is it any wonder they’re being subsumed by the web? In a related matter, the question of Chinese sensitivity to having its military “secrets” splayed out on the web is now becoming increasingly relevant. I have already linked to the AFP article indicating a new harder line on maps the Chinese government does not approve of, but the issue is worth revisiting in detail. This is the first time Google is specifically named in an investigation, along with its Chinese search competitors Baidu and Sohu. There are two separate issues: One is maps that show borders and labels which do not represent China’s official position — the disputed border with India, showing Taipei as a capital city, not showing the Spratleys and the Paracel Islands as Chinese… The other is satellite imagery of Chinese military bases or sensitive sites, along with user-generated content that meticulously identifies these features, such as on the Google-hosted Google Earth Community, whose annotated placemarks are automatically visible in Google Earth. That both China and India should demand that Google Earth show their mutual border to their own liking is of course an absurdity, and one that is impossible to reconcile on one global map. But Google has a potential way out in China: It already has a local Chinese variant of Google Maps, and as a study from 2007 shows, the Chinese Google Maps does alter its borders with India to reflect Chinese sensibilities. As for avoiding showing satellite imagery of sensitive areas? Easy — the Chinese Google Maps shows no satellite imagery at all; the button is simply missing from the map. This indicates that Google has preëmptively slaked China’s hunger for censorship in its local mapping product. There remains the question of Google Earth, however. Google is pushing Google Earth in China as an alternate means of following the Olympic torch around China. Does this mean that China’s censors will find fault with Google Earth? And what would the result of such official displeasure be? Ars Technica suspects that there will be changes made to Google’s global mapping database, to satisfy China: “We wouldn’t be surprised to see some ‘alterations’ made to Google’s maps of China in the coming months.” Myself, I strongly suspect that this will not be the case. I could definitely see Google Earth being kept out of China by authorities via its great firewall, and that would be a loss for Chinese surfers but not for everyone else. Instead, I expect Google to resist pressure from national governments — not just China but notably also India and Iran most recently — and instead to formulate clear policies as to how it will draw borders and label features. We’ve already seen Google’s naming policy for water bodies published, with a promise of more such policies being published soon. Of course, China could play hardball with Google. Because Google has an extensive presence on the ground in China, China’s government has all manner of judicial means to pressure Google into changing its global map database. If it should ever go this far, I sincerely hope Google simply closes up shop in China and calls it a victory for free expression over censorship, even if the cost is high. Censoring Chinese citizens to satisfy local laws is one thing. Censoring the rest of the world to be allowed to do business in China would be a completely different matter.